Select this option if you don't want AB Commnder to change the result of pressing the Delete key. In such a case, the result will depend on the version of Windows that you are using: some versions prompt you to confirm the operation, others move the selected files to the Recycle Bin without asking for confirmation. This option changes the behavior of the Delete command, as well as the function of the Delete key. If this option is checked, then when you delete files within AB Commander, it checks whether they can be moved to Recycle Bin, and if so, it moves the files there without displaying the Delete window or asking you to confirm the delete operation. If AB Commander determines that the move to the Recycle Bin is not possible (for example, if the files are located on a removable drive), then it displays the Delete window and/or asks you to confirm the delete operation. You can override this option and force the Delete window to appear by pressing the Ctrl+Shift+Delete keys (instead of just Delete), or keeping the Ctrl key pressed while clicking on the Delete buton on the toolbar. If this option is selected, then AB Commander will show the Delete window when the user presses the Delete key. If this option is selected, then after you have deleted or moved an item with AB Commander, it attempts to automatically select the next item for you. If this option is cleared, AB Commandes does not attempt to select the next item after the 'delete' or 'move' operations. This option is available on computers that have Windows Vista or a later version of Windows. If this option is selected, it causes AB Commander to copy the "created" time attribute when copying or synchronizing files. If this option is not selected, then the default Windows behavior is taking place, that is the "created" time of the destination file is set by Windows to the current system time, rather than the "created" time of the source file. 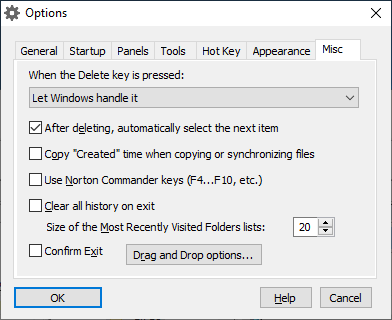 Note that this option has no effect if the copying if performed using the standard Windows drag-and-drop protocol. In order for this option to take effect using the drag-and-drop, you must select the alternative drag-and-drop protocol in the Drag and Drop options window of AB Commander. If checked, this option causes AB Commander to recognize the keyboard shortcuts used by Norton Commander. If checked, this option causes AB Commander to delete the contents of its history lists when exiting. Note that it only clears the history maintained by AB Commander, and it has no effect on the history lists maintained by Windows and Windows Explorer that may appear within AB Commander. The maximum number of items that AB Commander should retain in the Most Recently Visited Folder (History) lists. If checked, this option causes a confirmation prompt to be displayed before exiting AB Commander. Press this button to open the Drag and Drop options window of AB Commander.